LEWY BODY DEMENTIA in 2019 - All the key things you need to know. Getting a better understanding of Lewy Body Dementia is important for those living with it or those supporting a loved one that has it. Dementia is now one of the most high profile conditions affecting people in later life, with over 50,000 men and women in the UK diagnosed in 2016 alone. Despite this, it’s estimated that around 44% of people with Dementia never receive a diagnosis. One of the most common forms is Lewy Body Dementia or as it is also known, Dementia with Lewy Bodies. Last year the total of UK individuals with the condition stood at 850,000, the majority of which were aged over 65. Although Dementia is often thought of as one condition, it actually represents many. For this reason, Dementia is experienced differently by everyone, and can produce different symptoms in varying degrees. A diagnosis of Dementia can be devastating. However despite the degenerative nature of the condition and lack of a ‘cure’, those living with it can still enjoy healthy, happy lives. A key element in improving quality of life and wellbeing for people with Dementia is an understanding of the condition – and how its symptoms can affect a person. This is important, as it enables us to know how those symptoms can be alleviated. As research progresses, so too does the wider appreciation for Dementia’s widespread effect. At UK Care Guide we’re passionate about providing clear, comprehensive information for individuals seeking care, and their families. In this article we share information about Dementia with Lewy Bodies and how it is experienced, diagnosed and treated, and provide tips to help you to understand how you can support someone or help yourself if you have been affected by it. You can also read more about memory clinics here. They are facilities that have been designed to help diagnose dementia. Lewy Body Dementia, or sometimes called Dementia with Lewy Bodies, is a progressive type of dementia that accounts for 4% of all recorded dementia cases, however it is often misdiagnosed, with many mistaking it for Alzheimer’s or Parkinson’s disease because of the shared symptoms. It is generally agreed that in reality around 10% of all Dementia is of this type. Named after Friederich Lewy who first identified their presence in the brain of a patient in 1912, Lewy bodies are abnormal protein deposits that disrupt the normal functioning of the brain. These protein deposits collect in the brain stem and inhibit the production of dopamine (a neurotransmitter that is involved in sending transmissions around the brain and rest of the body). This can result in symptoms that may appear to indicate Parkinson’s disease – such as tremors or shaking, loss of movement and speech impairment. In Lewy Body Dementia these protein deposits spread into the brain’s cerebral cortex where it disrupts and depletes the presence of a chemical called Acetylcholine. This depletion in turn disrupts the general thinking, perception and behaviour of the sufferer. As suggested above, Lewy bodies are responsible for several progressive brain-effecting disorders, which include Parkinson’s. Like other types of dementia, Dementia with Lewy Bodies predominately affects people over the age of 65 (however it is not unheard of in younger people). Because of the shared source of the disease the symptoms can often be present together, with many DLB sufferers developing motor problems. The same is true vice versa – as many Parkinson’s sufferers will experience some cognitive impairment as the disease progress. Unfortunately as with many types of this condition, Lewy Body Dementia is indiscriminate, with no known concrete cause or catalyst responsible for its development. Research suggests that there are no risk factors that can be attributed to the development of Dementia with Lewy Bodies, and though there have been some findings and studies that suggest a genetic link, it is very rare. Symptoms of Lewy Body Dementia? An individual may show a variety of symptoms akin to other types of Dementia (particularly Alzheimer’s) and Parkinson’s disease, and for this reason it can be hard to diagnose. As is the case with other forms of Dementia the disease is also very subjective in that it can present itself differently from person to person. Disturbed sleep – sufferers can often appear to be acting out their dreams or nightmares. As the disease progresses the symptoms above will become more noticeable and tend to get worse. Notably, an individual’s memory can become much worse, akin to mid to later stage Alzheimer’s, as well as their general behaviour (periods of agitation and challenging behaviour will become more common). One of the areas that a change becomes noticeable is simply forgetting the time or day. This is why a dementia clock is such a wonderful product to have around the home. You can read our guide on top tips when buying a dementia clock here. In the later stages of the disease an individual will require intensive round-the-clock care. As mentioned above, the diagnosis of Dementia with Lewy Bodies can be problematic because of the parallels with other conditions, and it is recommended to seek the opinion of a professional with experience with this disease. Diagnosis of Dementia with Lewy Bodies can involve analysis of behaviour (professionals will look for the symptoms that are distinct to Dementia with Lewy Bodies) and often CT or MRI scans. The treatment of Dementia with Lewy Bodies using drugs is generally not advised as it can have very dramatic effects on individuals, and there is no indication of how a person may react to the medication until it is trialled. However there has been some success with managing some of the symptoms (including hallucinations and confusion) using medication usually given to Alzheimer’s patients. Sadly there is no cure for Dementia with Lewy Bodies, however sufferers can live many happy years with the disease when carefully managed. Complementary therapies and day-to-day activities and routines can be incredibly helpful. There’s more on this later on in the article. What should I do if I think my relative is affected by Dementia with Lewy Bodies? If you think that you may be experiencing symptoms of Dementia with Lewy Bodies, you should firstly contact your GP for an appointment. Depending on the severity of your symptoms at this stage you might like to take someone with you, or write down your thoughts, feelings and the symptoms you are experiencing. Make sure that you are taken seriously, and ask for a second opinion if you feel you have not been listened to. Studies have shown that death caused by Dementia can be delayed or prevented through early intervention and treatment – so it’s important that you get to the bottom of your symptoms early on. It may be that you have another condition – or perhaps nothing is wrong at all. If you suspect a relative or loved one may be affected Lewy Body Dementia, the first step is to approach them sensitively about the subject. Often individuals with Dementia are not aware of the severity of their symptoms, and can quickly become defensive if they feel they are being accused or questioned. To know for sure they will need to see their GP before being referred to a specialist – so they must be on board and willing to see medical professionals about their symptoms. It can be challenging and upsetting to discuss Dementia with a loved one, but as mentioned above, early intervention can significantly improve their quality of life. If you already have a Lasting Power of Attorney in place for your relative relating to their health and welfare, you may be able to contact their GP on their behalf and ask for an investigation or support as necessary. I’ve been diagnosed with Dementia with Lewy Bodies. How can I help myself? A diagnosis of Lewy Body Dementia is understandably very difficult – but it doesn’t mean that you have to stop doing the things you enjoy, or forget about your future plans and hobbies. In fact, the opposite is true – as the symptoms of Dementia can be alleviated with a range of everyday activities. Gardening, crafts, baking and singing have all been shown to maintain healthier brain function. Puzzles such as crosswords and Sudoku are also great ways to keep your mind sharp. Keeping active and eating well is also important. Try swimming, walking or dancing – these have been shown to stimulate the brain as well as promoting physical fitness. There are lots of tips you can employ to help you to live well with Dementia on a day to day basis, too. For example, many find that sticking to a simple routine is incredibly helpful. Keep a calendar and a large clock handy, and ensure you’re staying in touch with family and friends, as communication is key. 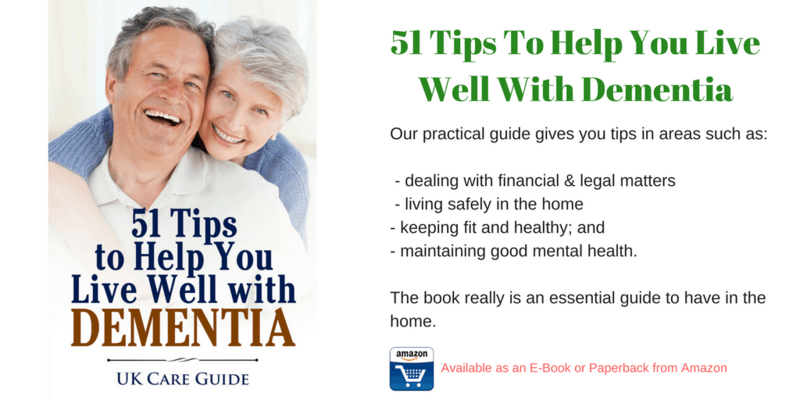 We would recommend you have a look at our book, 51 Tips to Live Well with Dementia, or some very useful every tips to help you care for someone with Dementia with Lewy Bodies. Alternatively, if you do not want the book, you can read the 51 tips in our article here. Dementia with Lewy Bodies has specific symptoms that may not be experienced by other Dementia sufferers, such as disturbed sleep, hallucinations and problems moving around due to difficulty perceiving distances general and confusion. As above, there are small things you can do and relatively inexpensive purchases you can make to ensure that your quality of life is maintained – and your safety. For example, if you are living independently at home then some safety measures may be appropriate – such as a frame for walking with, a stair lift, ramps and handles to hold on to. Here is a video from the Alzheimer’s society on Lewy Body Dementia. In the early stages of the disease it is possible to manage the care of a loved one without additional support. As the disease progresses it is important to strike a balance between keeping the person’s routines and habits the same, whilst as the same time making sure that their needs are met. Supportive treatments can also help – therapies including physiotherapy and speech therapy can help sufferers regain some of what they’ve lost. Other ideas for helping your loved one stay as well as possible include specific ‘Dementia activities’. These tasks, which are tailored especially for sufferers, help keep the mind active and occupied, yet are within the patient’s capabilities. For more information you can take a look at our dedicated articles on Dementia or visit the NHS website page about ideas for Dementia activities or to find specialist groups in your area. Remember that caring for someone with Dementia can be physically and emotionally exhausting. You may need to find counselling or support for yourself – or seek out dedicated groups that provide respite care whilst offering support and space to talk and discuss with other carers. As Dementia with Lewy Bodies progresses it’s often necessary for the person affected to access professional care – either at home, or in a specialist establishment. However choosing a care provider isn’t always straightforward – as there are now so many to choose from. It’s very important that the care providers you are considering have specific experience and expertise in dealing with individuals with Dementia – preferably Dementia with Lewy Bodies. We recommend creating a shortlist before using reviews and your own judgement gained through visits and meetings to narrow the list down to a final selection. You’ll also need to think about the cost of the care, and your relative’s personal preferences and welfare. Care at home is more affordable than residential care – but it isn’t always appropriate (or sufficient) for someone in the later stages of Dementia. Residential care is expensive, and isn’t always necessary, especially earlier on following a diagnosis. Finding a perfect balance between these three elements isn’t always possible. You can read our information guides on paying for care for more information. Often individuals don’t wish to leave their property and go into residential care, but there are a growing number of care solutions that accommodate for service users who wish to remain in their own home. You can find more information about choosing a care home or care provider here on the website. You’ll also find plenty of financial and legal advice regarding care provision and preparation for care in later life. For more information about ongoing care, help and advice for patients and carers, please explore the rest of the UK Care Guide website where you will find useful information about caring for your loved one. You can read more about other forms of dementia below. More detailed information about Dementia, what causes it the different types and how to identify the symptoms. Read more about Vascular Dementia, another common form of Dementia. Read more about Frontotemporal Dementia, another form of Dementia. Our blogs on Dementia are often written by those living with dementia or involved with dementia care. In their blogs they share their experiences of dementia.